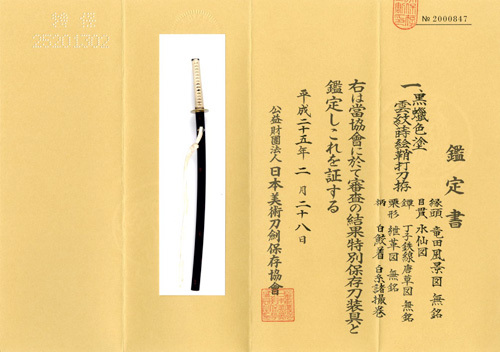 Blade construction (kengyo) : Shinogi-zuruki, Iori-mune. Ō-suriage substantially shortened being unsigned. Wide in Mihaba and there is less degree of tapering from base to point featuring lower base pointed curve to say an indication of Koshi-zori. Proportion of Hiraji is wide to Shinogi-ji leading to a large point of Kissaki. There is round-end Bo-hi groove on both sides. 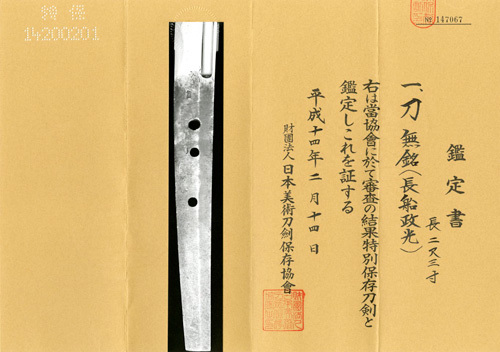 The entire shape has a highly dandyism style to state a clear example of golden age in Nanbokucho period. Forging pattern (kitae hada) : Kitaehada is conspicuous large Itamehada assorted with partial Mokume burl marks which is active with Chikei thick lines of Nie. 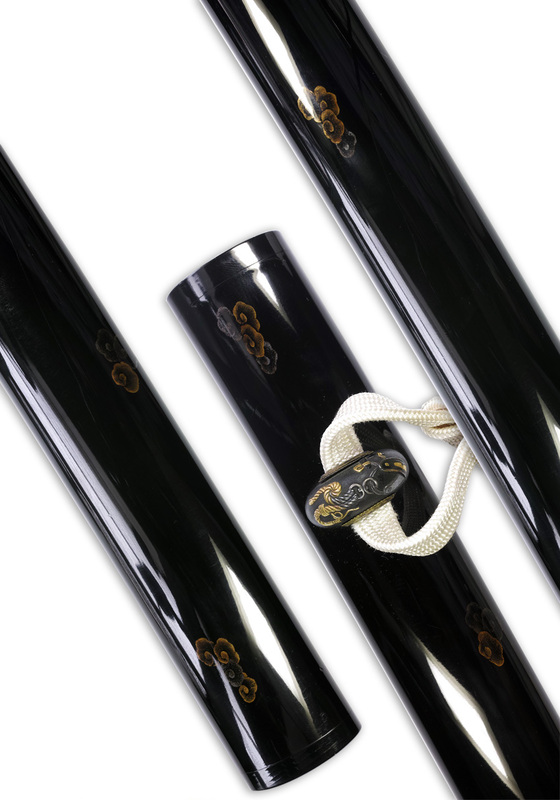 The entire hiraji is covered in with speckled Ji-nie sparkling hard metal granules over the surface to generate clear Midare-utsuri reflection which is in sympathy with the irregular tempering outline. Tempering pattern (hamon) : Hamon outline is fine Nie base a bit on tighter side in Nioi, small Box-like or slanting irregular pointed Gunome or clove-tassel outline Choji-midare of which head outline radiates sparkling Nioi mist being Midare-Utsuri. The interior of temper is covered in full of soft and misty Nioi. Temper of tip (boshi) : Boshi is irregular pattern of large Gunome with large circle turns back shortly. Tang (Nakago) : Nakago is Ō-suriage of substantially shortened being unsigned. Kiri horizontal shape of heel. Three Mekugi-ana peg holes. Kiri horizontal filemarks.